Have a party coming up in the next few weeks that you want to make extra posh? Try making your own extra-special brew with the Gentleman Maker’s SmartBrewer! Make sure you have an Adafruit IO account ready to go and your Particle Photon on hand. With the holidays just around the corner, it’s time to start thinking about parties! And with most parties comes some form of alcohol, whether it’s eggnog or a nice pint of beer. But for some connoisseurs, store-bought beer is just not enough—or just not feasible. That’s why many people turn to home brewing! Typical brewing systems involve a bucket, some ingredients, and a tad bit of patience, but for an engineer such as myself, that is not enough! We want to know exactly what is going on with our beer at all times. In this project, we will create the SmartBrewer, which will allow us to monitor our tasty golden ale as it brews—just in time for next month’s party! Check out Scheme-It for the full SmartBrewer schematic. When brewing alcohol, it is imperative that no contaminants, such as dust and insects, get into the vessel. Otherwise, the brew can go bad. To prevent outside contaminants from getting in, an airlock can be used, which consists of a U-bend filled with water. This allows pressurized gas to leave the container, but it does not allow anything from outside in. However, one of my last brews was nearly ruined because the container itself was not airtight, which could have ruined the batch. Oxygen must be kept away from brewing vessels, as oxygen allows a special bacteria, acetobacter, to turn alcohol into vinegar. Brewing vessels also run the risk of exploding, should the vents and valves be blocked, so the pressure sensor can let us know before that happens! To determine how much alcohol is in a brew (which is also an indicator of when it’s ready to drink), a hydrometer is used. A hydrometer is a special glass vile with a scale printed on the side that will float at a specific level, and this level indicates the specific gravity. Most hydrometers are analog and they require manual reading. We need to be able to read it without opening the container. To achieve this, we will attach a small magnet to the top of the hydrometer and then have a magnetic sensor above the hydrometer. As the content of sugar and alcohol change, the hydrometers floating depth will change, and this will result in a difference in height above the fluid. Therefore, the position of the magnet will change, and this will be measured by a magnetic sensor. While temperature is important (as fermentation occurs over a short temperature range), humidity is not. 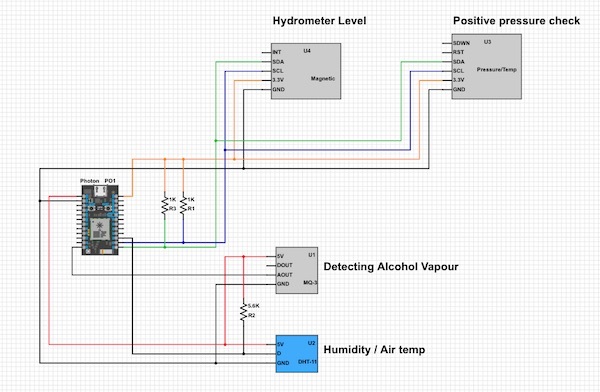 However, as this is a sensor project, I thought it would be interesting to measure as many things as possible, including humidity. It could turn out that humidity does have an effect on the final product. This could mean that future brewing vessels may have humidity control! This is another curiosity reading because, in theory, a solution containing alcohol should have some alcohol vapour coming off it. Therefore, it would be an interesting reading to take, as it could reveal how much alcohol is in the atmosphere and, therefore, how much is being lost. The code for this project is fairly simple. You can check it out on Particle IO. With everything constructed, you should be perfectly prepared to create a unique beer of your own. Take note of the data you collect—you could very well come up with the newest equation for the perfect brew. Looking for more Gentleman Maker videos? Check them all out here on All About Circuits.